Toddlers Learn through Laughter. No Kidding. While some say laughter is the best medicine, it turns out that it’s not so bad for learning either! A new French study found that humor helps toddlers learn. In the study, Rana Esseily and her colleagues designed an experiment to see whether using humor impacted the learning abilities of 18-month-olds. During the study, each child watched an adult using a tool to grab an out-of-reach toy. In one group, the adults played with the toy after retrieving it. In the second group, the adults immediately threw the toy on the floor after getting it. This made half of the toddlers laugh. When the research team reviewed the data, they found that the toddlers who laughed were able to repeat the action themselves more successfully than those who didn’t laugh, as well as those who were included in the control group. We laugh a lot in our classes. A lot. Children somehow remind us to laugh and smile and notice the little things in life. Take this child. 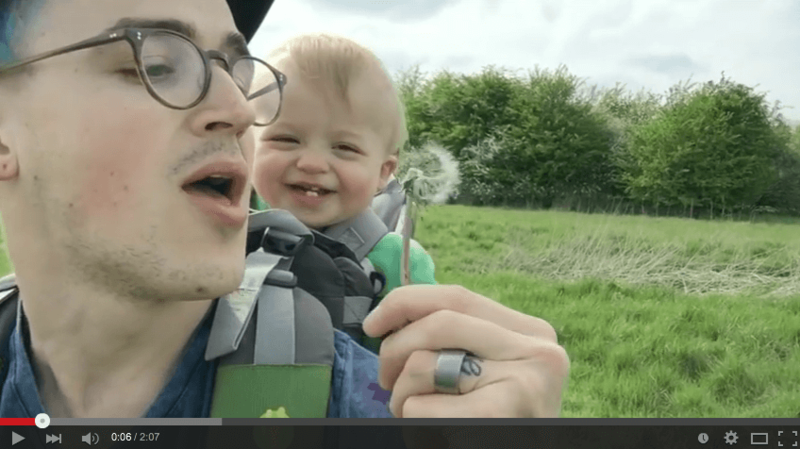 He can’t stop laughing at what his dad does. 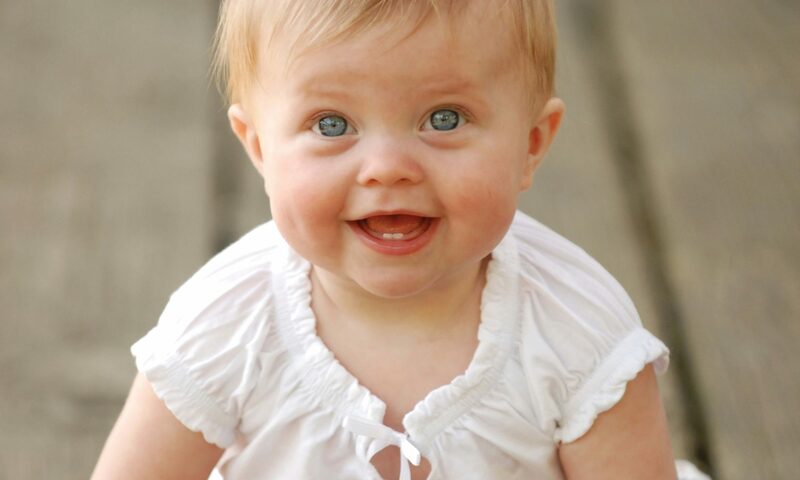 On average, children laugh about 200 times every day. Silliness is a great way to evoke laughter and foster the development of humor (and help kids learn, too!). 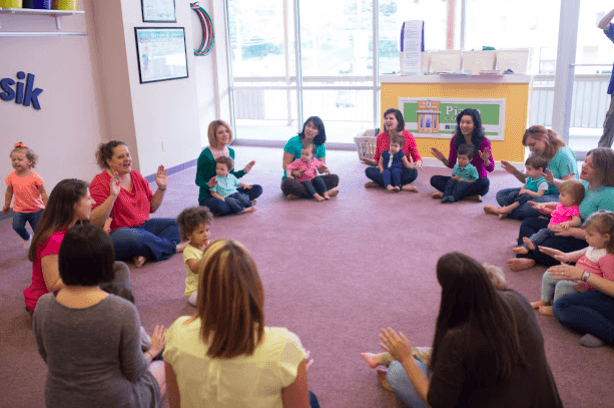 So, we include a lot of it in class each week, including singing songs with silly words (guli, guli, guli), playing one-bell jingles with our feet or on our head, and even a surprise tickle. All that laughing encourages a child’s physical, emotional, and social health. Plus, it’s a lot of fun and can be a developmentally appropriate way to motivate, engage, and redirect children during the early years. Try out some of our favorite musical jokes and see if you can get a chuckle out of the kids in your life! 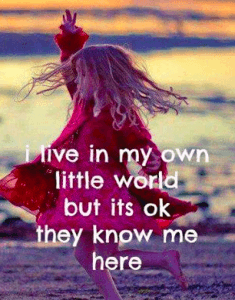 Contributed by Lisa Camino Rowell who admits to laughing with her young kids so much that tears fall. Yes, they were a little bit right and a little bit not right, but they certainly had fun imagining what it would be like! What about you? 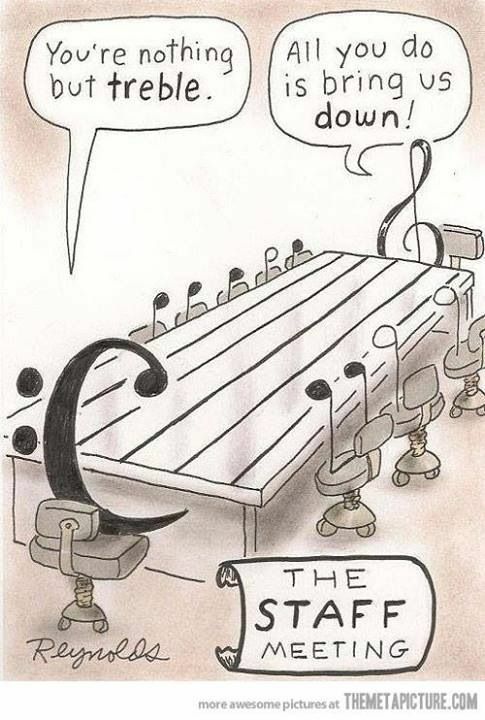 Have you ever imagined what happens in a music class? Well, if you think that there would be some singing, listening to music, playing instruments, and dancing, you would be partly right. (Okay, mostly right!) However, in music class, we do things that may surprise you—or to be more accurate, you may be surprised to find yourself doing them. Take a look at just a few things people have said that they are surprised to find themselves doing in a Kindermusik class. I sang out loud where other people could hear me and I didn’t care. Yes, we sing in the shower, in our cars, or maybe at a place of worship or at a concert with thousands of other people; however, I never expected to sing out loud in a small group setting with a smile! My children loved hearing my voice and seeing me participate in class. In fact, it helped them love it even more! I pretended to be a peep squirrel (whatever that is! ), a slithering snake, a hopping rabbit, and all sorts of other animals. Again, all of this happened in front of other people and I did not care. For one, they were pretending to be those animals, too. More importantly, my children reminded me just how fun it can be to give in to my imagination. I purposefully wore my super fuzzy cozy socks with multicolored toes to show the other parents. Then told the other parents where to buy them. In music class, we take off our shoes so it’s all about the socks…or the pedicure during those warmer months. So not only, did the other parents and I exchange parenting tips specific to the age of our children we also shared where to find the cutest socks—or where to get the best pedicure in town. I broke out in a sweat hoisting my child up in the air, swinging her in a blanket hammock, and bouncing my little one up and down in an imaginary little red wagon. It was a workout for me. The best part: Those “sweaty moments” tended to be full of giggles from my child. I learned new languages…sort of. 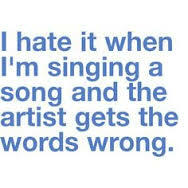 Technically, I learned to sing different songs in other languages: Spanish, French, English, and more! I finally found a place to put to good use all those dance moves I collected in my younger years including the Sprinkler, the Cabbage Patch, the Electric Slide, and even the Macarena. And, while I never had moves like Jagger, my children loved dancing with me and trying out those moves, too. Share your own “unbelievable” story on our Kindermusik Facebook Page by completing this phrase: I can’t believe I Did [BLANK] in Kindermusik class. Contributed by Lisa Camino Rowell, a freelance writer in the Atlanta area. Her children, now 9 and 7, still request a ride on the little red wagon—and it is STILL a workout. Children can easily find a reason to laugh—throwing a spoon on the floor, jumping into puddles, saying a made-up word, a dog eating popcorn. Hil-ar-ious! You couldn’t help but laugh, right? 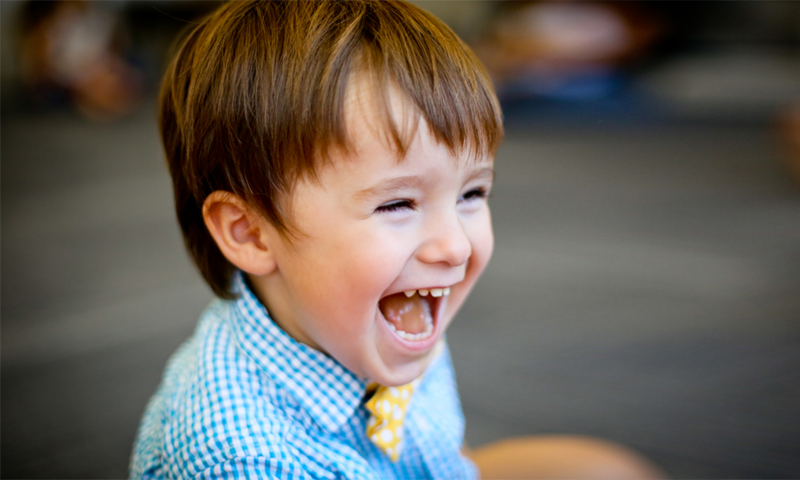 Children literally bring more laughter into our lives by laughing 10x more each day than the average grown-up. (No wonder Peter Pan never wants to grow up!) All this laughter and silliness is actually teaching children what’s funny—and what isn’t. 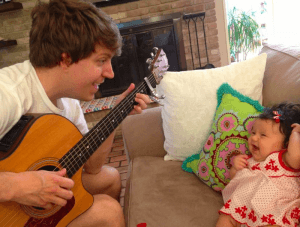 Support an older child’s growing sense of humor with these musical jokes. You might try the popcorn trick, too! So the pianist would have a place to put her coffee. What do you call a cow that can play a musical instrument? What part of the chicken is musical? Looking for more ways to evoke laughter from kids? Try these silly Kindermusik songs! Somehow, though, when children mis-sing a song, our love for them grows and we run to get the camera to capture the cuteness! Take this sweet little nugget. He is singing a beautiful rendition of “Fifty Nifty United States,” including Georgia, Hawaii, Indiana, and the newest state of the union: Massachusettsippigan. Mis-sung lyrics is one of the reasons we include lyrics in Kindermusik classes so we can read the words to an unfamiliar song. 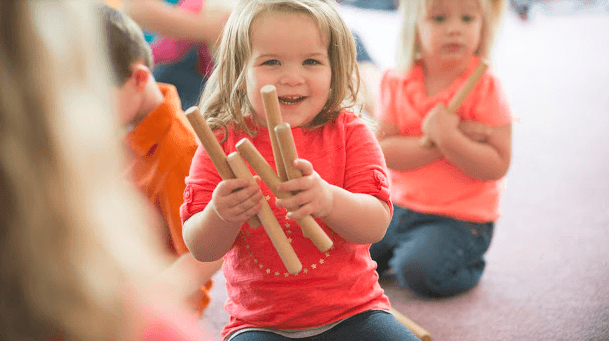 However, while Kindermusik certainly supports early literacy development, most Kindermusik students are not fluent readers so they can create some of their own interesting lyrics. Here are 5 “mis-sung” lyrics heard in a Kindermusik classroom. Actual lyric: Bring back, bring back, oh bring back my Bonnie to me! Yes. It’s true. 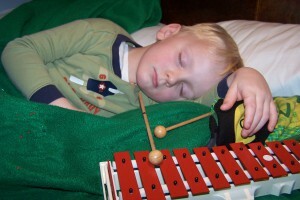 My daughter, Ellery, slept through Kindermusik class—for four months! Now, before you begin conjuring up images of a snuggled and swaddled baby girl being gently rocked to quiet lullabies, let me stop you. She was two and not really asleep. She just didn’t want anyone to see her. And, in fact, if I am perfectly honest, she didn’t always want to go to class. 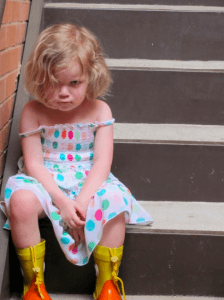 She wanted to play on the stairs outside of class or smell the tulips in front of the building or peek in the window during her older sister’s Kindermusik class. But, as soon as we stepped inside her class, the eyes would shut and she would slump in my lap—asleep. At this point, I should confess that I thought I had this parenting—and Kindermusik—thing down. After all, I lived and breathed Kindermusik as the Senior Director of Marketing for seven years at Kindermusik International. I knew all the latest parenting—and music education research—and participated in Kindermusik classrooms around the world long before becoming a parent, which meant I learned from THE BEST in the business. Plus, we had Emerson, our oldest daughter (AKA “The Rule Follower” and “Safety Patrol”). But, along came Ellery, our spirited child. 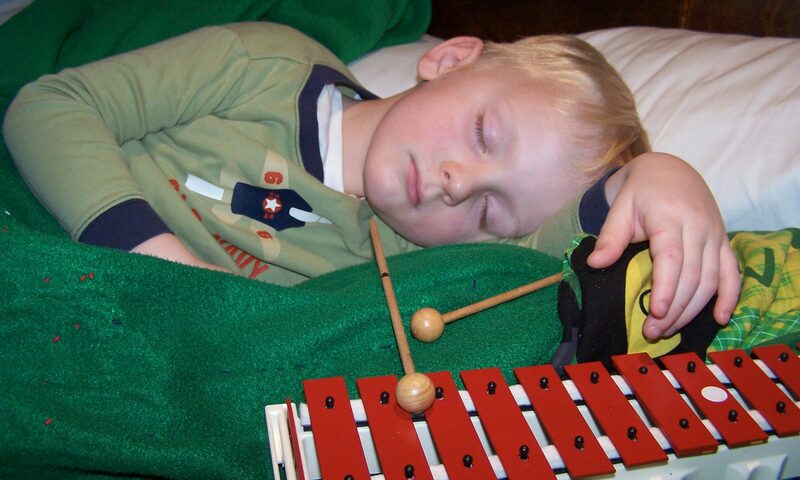 Now, if you’ve never had to participate in an active Kindermusik class with, um, a sleeping child, it’s not easy. It’s kind of like taking the class by yourself, while swinging a 25 pound bag of sugar in the air and bouncing it on your knees! But, thankfully, I knew one thing. Ellery was absorbing it all in and participating in the way that best fit her at that developmental stage. How do I know? Well, on the car ride home, she would sing all of the songs, repeat the fingerplays, and even mention certain things her teacher, Jane Hendrix, said in class. Then later, Ellery and Emerson would play Kindermusik class in the living room and (surprise, surprise!) Ellery would be fully awake for that class! I knew that this sleepy behavior could last the first few classes as Ellery adjusted to this new group of friends. In fact, it can often take five weeks for a young child to feel confident enough to participate more actively in class. And, I was right…sorta. I should mention that our Kindermusik Educator, Jane Hendrix, took my Ellery in stride. Every week Jane would try a new tactic to encourage participation while also fully accepting Ellery’s form of engagement. In fact, we would often “sleep hello to Ellery” at the start of each class or sing “Resting in the Green Grass.” Eventually, Jane uncovered the one thing that finally coaxed Ellery’s eyes open for longer and longer moments—a dog puppet. Little by little Ellery began to participate with her eyes open, as long as the dog puppet watched. She danced with the dog. Played instruments with the dog and even got to take the dog home one week to play Kindermusik at home. She took that dog everywhere, which meant we played Kindermusik everywhere! 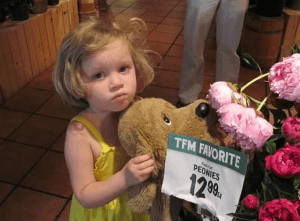 We even sang hello–well, barked hello–to the peonies at the grocery store. I would love to say that from that day forward Ellery eagerly bounded into class each week, but no. She still wanted to play on the steps, smell the flowers, and basically do her own thing, but we kept going and learning and playing and singing. And, you know what? It paid off, because I have the gift of time to see how it did! As parents, it takes years to see the fruits of our labor. Are we making the right choices for our kids? Is this worth the time, the money, the struggle? 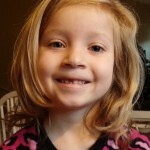 Well, today Ellery is halfway through first grade. And guess what? She participates with her eyes wide open! Kindermusik helped set the foundation for her love of learning—and her confidence to be herself. She loves to read, excels at math, and easily creates a network of close friends who accept her for her. Is she musical? Yes…but we plan to hold off on the drum lessons for now. You see. That’s the other thing. Kindermusik creates bonds that transcend the classroom experience long after a child “ages out.” I know that Jane will always celebrate Ellery for who she is. It’s why Jane—and Kindermusik—will remain firmly planted in my heart. Every child is welcomed in Kindermusik and celebrated for who they are and how they participate. There is no right or wrong way. Even when children don’t seem to be participating in class (i.e. sleeping or running or sitting in your lap), they are absorbing and participating in their own unique way. It’s one of the reasons why Kindermusik provides materials for families to use together outside the class. Children are most comfortable at home in their own environments. It is worth it…even when they sleep through class! 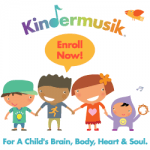 Find a local Kindermusik educator at www.kindermusik.com and experience firsthand how we celebrate every child! Contributed by Lisa Camino Rowell, a freelance writer living the Atlanta area.